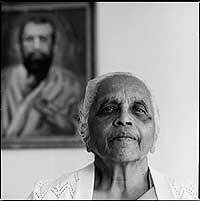 Maniben Sita was born in 1926, in the Asiatic Bazaar, (Marabastad, Pretoria, into a family that was politically active. Her father Nana Sita, who had met and been greatly influenced by Mahatma Gandhi, joined the Transvaal Indian Congress (TIC) in 1928. He was an executive member and chairman of the Pretoria branch. Between the two world wars, there was a great deal of in-fighting in Indian politics as differences in ideology began to be asserted and various political groupings began to define themselves. In the TIC, the young radicals who called for passive resistance opposed the older more cautious members who favoured negotiations. Because of these and other differences, TIC meetings had become violent and on 4 June 1939, members of Dr Yusuf Dadoo’s group were attacked, some were badly injured and one died. Maniben who was thirteen at the time overheard her father’s account of the dreadful events at the meeting and that awakened her to the problems of the Indian community. Thereafter she took a keen interest in the political situation, read widely and prepared herself to become an activist. After completing her studies at the Indian High School, she completed matric at a college in Silverton. On passing matric, Maniben enrolled for a BA degree with the University of South Africa (UNISA), while taking up a teachers’ course at the same time. She qualified as a teacher in 1957. When the congresses decided on the Passive Resistance campaign, she and Mrs Thayanayagie Pillay, organised a group of women volunteers. They formed the Indian Women’s Support League and helped to raise awareness and to raise funds for the TIC. Maniben went to prison twice during the campaign, in 1946 and again in 1947. Before the Defiance Campaign, she accompanied her father and Dr AB Nkomo and addressed mass meetings and recruited volunteers. In 1952, she and two comrades from Lady Selborne were arrested and sentenced to three months in Pretoria Prison for occupying a bench at the railway station marked for whites only. In December 1963, Maniben joined the march to the Union Buildings led by Zainab Asvat against group areas relocations and the establishment of the Indian National Council, an advisory committee appointed by the government. From 1963 to 1967, Maniben supported her father in his stand against the Group Areas Board. When the family was given notice to move, Nana Sita defied the order, refused to pay fines and was sentenced to jail terms of three and six months in 1963, 1964 and 1967. Nana Sita died in 1969 and Maniben and her mother, Pemiben, continued to live in their house on Van der Hoff Street in Hercules until 1976 when they were threatened with expropriation of their property and forced to move to Laudium. In 1982, when elections were being held to give legitimacy to the South African Indian Council (formerly the Indian National Council), the TIC was revived and Maniben became an executive member. The TIC joined the United Democratic Front (UDF) that was formed to halt the establishment of the Tri-Cameral Parliamentary system. Maniben became an active campaigner, speaking at many mass meetings and exhorting people to boycott the elections. On election day in August 1984, Maniben sat outside the polling station in Laudium dressed in black. She was a silent sentinel, a reminder to people that these were not democratic elections. In 1985, Maniben was one of those chosen to represent the TIC at the funeral of the Cradock four and she travelled down to the Eastern Cape on the special bus hired for the journey. On the way back, the bus was stopped just outside Lenasia and all the passengers were detained and sent to Diepkloof Prison. Maniben spent 87 days in solitary confinement. On her release, she continued to participate in protest activities against apartheid. In 1995, Maniben representing a ward in Laudium was elected to the Centurion Town Council in Johannesburg. She served as an ANC Councillor for five years.